Here's a fun little project I completed a couple of weeks ago. ALL of these pictures can be clicked on to get a pop-up with a larger view! I got all this FABULOUS Heidi Grace patterned paper not too long ago from my local scrapbook store (ATS carries some of the same patterns here) and wanted to make something other than a card with it (LOL it was a purely selfish motive - I wanted to keep the paper and also display it in some way so this is what I came up with! *wink*). I pulled out some 4" coasters (I got mine from Starlitstudio eons ago - these are the MEDIUM WEIGHT ones) and cut ten 4x4" squares from 2 of the different sheets of patterned paper. I cut ten so that I could cover both sides of the coasters (it gave them a more finished appearance in my opinion). Before adhering the paper I used my Stampin' Up! 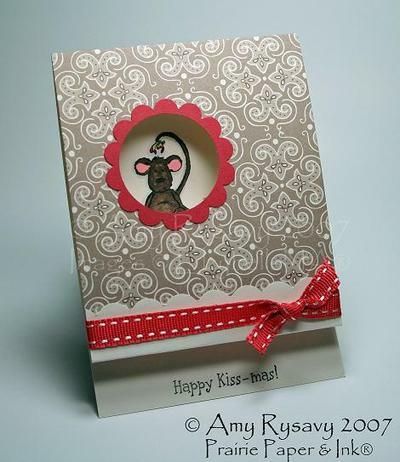 3/16" Corner Rounder punch on all of them (that punch is PERFECT for rounding the edges when covering coasters!). I then just used Mono Multi adhesive to adhere the papers (I could have used Mod Podge but I wasn't in the mood for the mess - I tend to cover myself more than the project when I use Mod Podge ROFLOL!!). 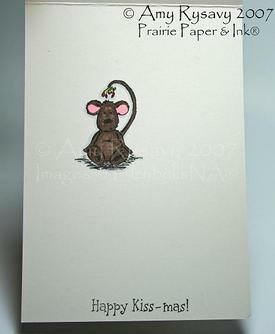 The chipboard letters are also from Stampin' Up! - the On Board Simon Lower® set (since there is only one of each letter per set I try to order a set each time I put in a SU order so I have extras on hand). I just traced each letter onto the patterned papers with a pencil then cut them out with scissors. Again I used Mono Multi to adhere the paper to the chipboard, and with the letters I used files from this Basic Grey file kit to file down the edges that either stuck out too much or that I didn't cut smoothly enough with the scissors. The hinges are from the Dollarama - I got several packs of them (there were 3 pairs of hinges in 3 different sizes (so 6 altogether) plus snaps for $1!!) some time ago - I didn't use the snaps to attach them tho. I marked on each coaster where the holes from each hinge would be - then used my paper piercer (a heavy-duty needle would work as well) to pierce the holes. I don't know how well you can see in these pictures but the dotted paper is flocked (so fun and fuzzy!) while the darker blue papers are embossed and glittered and shimmery and WOW. It's really hard to SHOW just how gorgeous these papers are in real life - and looking at them online in any store just DOESN'T do them justice - but trust me these papers are GORGEOUS! I didn't add any other embellishments to this - I wanted all the patterns and flocking and glitter to stand out so I left it all as is. It ended up being a pretty quick and easy project - and it matches my tree (that was the reason I got the papers in the first place) - my decorations are blue, white and silver (I finally got my tree up and all the decorations on it - hopefully I'll be able to get a decent picture of it to share on here soon!). GREAT notecards. Love the Amuse stamps too - and a sucker; how special is that??? Thanks for the change to win! CONGRATS MICHELE!! Please e-mail me with your mailing addy and I'll get those stamps, sucker and card sent out to you ASAP!! Since it's a GM dealership they work at I HAD to use my Classic Pickups set (I *heart* this set and am still sore over Stampin' Up! retiring it - it's an AWESOME masculine set!!) and the Much Appreciated set for the sentiment. I used re-inkers and my Aqua Painter to watercolor the truck (stamped on Confetti Cream card stock) then matted it with Chocolate Chip and Blue Bayou card stock. 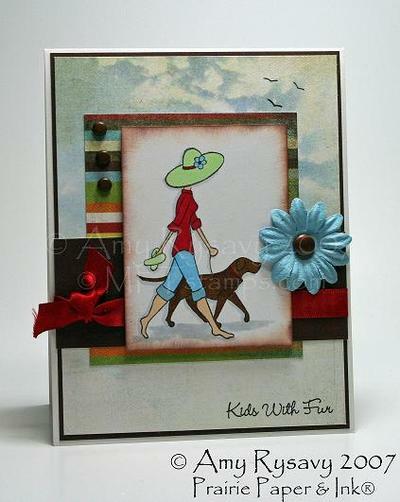 The striped paper is from Basic Grey's 6x6 Recess pack - that was what inspired this card's color combo. The brads are by Karen Foster (I've been hoarding them for MONTHS and finally decided to just use some already!! LOL) and the brown twill is by Martha Stewart (got it at Michaels). I did a little paper piercing using my SU! piercing template then finished assembling the card and that was it!! I had FUN playing with GinaK's new Text Messages set - I think it's so cool that the sentiments included are of a size and font that works PERFECTLY in the "display" of the phone!! So now they're all shiny and *cool* looking (LOL). 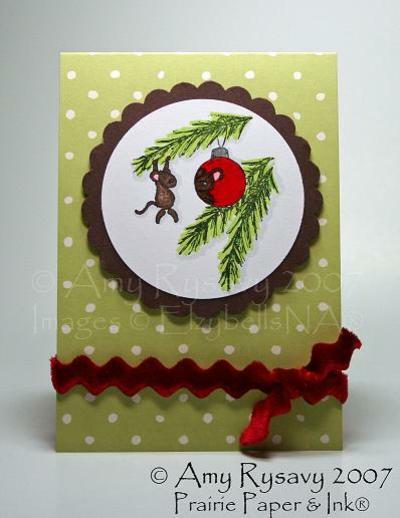 The patterned paper is from the Little Red Riding Hood Collection by Piggy Tales - I used my Stampin' Up! 3/16" Corner Rounder punch on the striped paper to make the scalloped edge. The flowers are red Prima Esprites and I attached them with Making Memories brads. I must say I was quite proud of how this card turned out!! I stamped the perfume bottle from the Text Messages set then used 2 large sticky notes to mask off a triangular-shaped "spray" area - then took my Stampin' Up! color spritzer with a marker and sprayed the color onto the card stock. When I removed the sticky notes that's what it looked like. and the Sakura Stardust pen on the spray part of the bottle. 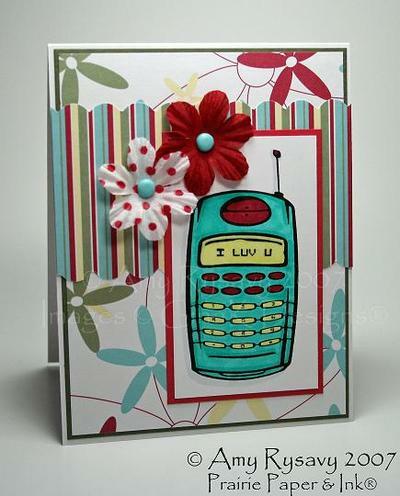 The sentiment is from the GinaK Punchy Words set - I used Stampin' Up! markers to color in the different parts before stamping it onto white CS then punching it out with my Marvy Extra Jumbo (yellow) scalloped circle punch (I sponged the edges with Barely Banana ink). I finished off this card with a couple of yellow Prima sprites (they went PERFECTLY with the floral patterned paper - score!!) attached with a MM brad and voila!! Thanks a Latte and some CANDY!! I FINALLY got the chance to sit down and play with my new A Muse Coffee Break set - it's a clear mini set and oh-so-cute. I decided to pull out some more of their new 4-Band Kitchen note cards (this time brown and red ones) and made a set of 6 thank you cards - I'm going to include them with the other things I got for my Mom for Christmas (she doesn't have a computer so I don't need to worry about her ever seeing this!). 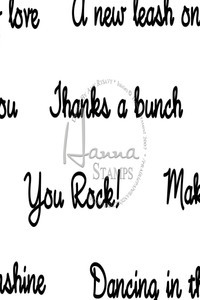 I stamped the images onto Very Vanilla (Stampin' Up!) card stock then colored them in with Stampin' Up! markers (Ruby Red and Creamy Caramel) and stamped the "steam" with Creamy Caramel ink. I of course HAD to add liquid applique and heat it up to make "foam". The scalloped squares were punched out of Stampin' Up! card stock (Creamy Caramel and Ruby Red) using my Marvy Giga Scalloped Square Punch, and before adhering them to the cards I added a tab of May Arts ribbon (it went PERFECTLY with these cards - I was stoked LOL!) that I folded over and attached with a brown Bazzill brad. I finished them off with the "thanks a latte" sentiment that comes with the set and they were done! Congrats goes to #94 - Michele!! Please e-mail me with your mailing addy and I'll get these goodies sent off to you!! I used My Favorite Things new By the Seashore Mini set and their Essential Sentiments set (you can get these either from MFT's site HERE and HERE or from All That Scraps HERE and HERE). I used Copic Markers to color in the main image. The patterned paper is from Basic Grey's Mellow 6x6 pack (I thought the sky/cloud patterned paper was rather fitting for this card....) and I stamped the flying birds stamps onto the patterned paper as well. Ribbon is satin red by May Arts, the flower is a Prima and the jumbo brad is from the Dollorama while the smaller brads are Bazzill. Want To Be On a Design Team? Well then here's your chance!! We've made some changes to the current All That Scraps Design Team - all the members currently on the team will be staying on with us until September 2008 and are now Senior Design Team Members. However we've decided to have another All That Scraps team and are looking for 6 new people to join! It's a 3-month stint officially starting January 1st and ending March 31st. So every 3 months I will be looking for 6 new members for our team! To find out all the info and what you need to know to apply please go HERE <------click!! After seeing Lauren's Saturday Sketch yesterday I HAD to play along - I have all these new uninked Bella stamps sitting here that are perfect - so for this I used sockafellabella - aren't they CUTE?? I stamped them onto Shimmery White (Stampin' Up!) card stock then colored them in with Copic Markers. I added dabs of liquid applique to their hats and heated it to make it fluffly. The patterned paper used is from KI Memories Alpine Collection (the bottom piece with all the words is actually shimmery paper - SO gorgeous in real life! ), while the ribbon I got at Michaels from the $1 bin. The sentiment is from this Cat's Pajamas clear set (I got all 3 of these sets WEEKS ago and this is the first time I've used them - I know pretty pathetic b/c they are ADORABLE stamps!). 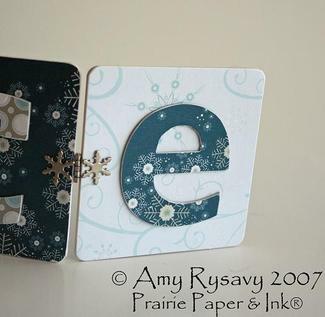 The snowflake is a Heidi Swapp ghost shape (LOVE those) and I just attached it to the card with some Mono Multi glue. "I am so thankful for my family. They are the most important things to me. Above all else! Thanks for the chance to win some hanna as I love hanna!" If you didn't know already Elzybells stamps are the latest rage all over the blogosphere and Splitcoast - and I've jumped on the bandwagon! Right now all I own is this Mouse Bauble stamp, the Mistletoe Mouse stamp and a couple of sentiments. However I just ordered some more and they should hopefully get here next week! For this card I stamped the image onto white card stock then colored it in with Copic Markers and punched it out with my Marvy Mega Circle punch. You can't really tell in this picture - but I used a clear Sakura gel pen on the ornament to make it shiny and "realistic". I also used my Spica Glitter pens on the branches and the ornament hanger. 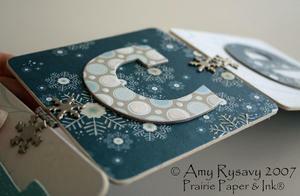 The scalloped mat was made with my Marvy Giga Scalloped Circle punch. The card base itself is one of the new A Muse 4-band notecards (they're sized 3.5x5") in the Kitchen Collection pattern. On the inside of the card I stamped the Twas Night sentiment. I had fun with this card (another A Muse 4-band notecard - this time from the Madeira Collection). I used my 1 3/8" circle punch to punch a hole through the note card. The scalloped "frame" was made by FIRST punching a 1 3/8" circle out of Ruby Red (Stampin' Up!) card stock then centering the SU! Scalloped Circle punch over it and punching it out - leaving me with this little frame which I adhered to the card over the hole. I just folded up the bottom then used my 3/16" Corner Rounder Punch to scallop the edge and tied on some American Crafts ribbon. Mistletoe Mouse and the Happy Kiss-mas sentiment were stamped on the inside of the card and I colored him in with my Copic markers. The best thing about these cards is that they were SO quick and easy to make!! Edited to Add: I did them both in under an hour while on the phone with a friend LOL! I sat down last week for a bit and made almost all of these cards in one sitting (I had to come back to finish the last couple of them but regardless they were really quick and easy!). I've been going through my patterned paper lately and cleaning out my stash and came across this sheet from Stampin' Up! that's retired now (I can't even remember the name of the collection offhand - I really liked it tho! The same patterns but a different color scheme is still available in the "Wintergreen" patterned paper pack). It wasn't a full sheet but I managed to get 7 4x4" squares out of it and proceeded to make 7 Christmas cards. I pulled out several different SU! sets for them: Peaceful Wishes, Lovely as a Tree, Many Merry Messages, Perfect Ending (retired) and Season's Greetings (retired). Then, to make the process even quicker - I stuck to a basic color combo for all the cards: Old Olive, Bravo Burgandy, Cranberry Crisp (retired) and Naturals Vanilla card stock. I used the same colors for the ink with a little Chocolate Chip and Always Artichoke thrown in here and there. For accessories I used Stitched Cranberry Crisp Grosgrain (retired), Wide Old Olive and Bravo Burgandy Grosgrains and Always Artichoke Grosgrains, the Ticket Corner and 3/16" Corner Rounder Punch (to make the scalloped edges) and Dazzling Diamonds glitter. 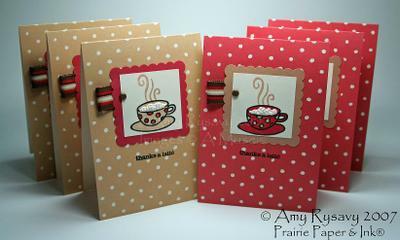 Y'all can get a better look at these cards by going to my gallery of Stampin' Up! cards here <-----click! I uploaded other shots of these cards just a couple at a time to get a closer view. Don't forget to enter my Hanna Stamps! giveaway if you haven't already (remember only one entry per person please!) by leaving a comment on this post <-----click! I won't be drawing a name for that 'till Sunday (Nov 25)! You can also check out the newly-up-and-running Hanna Stamps! site HERE <----click! I just LOVE GinaK's new Got Snow? set - you can get it from her store here as well as here at All That Scraps. 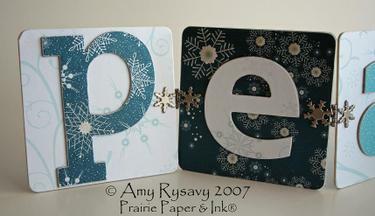 For both of these cards I used Basic Grey's new Figgy Pudding paper (something else I LOVE - man is it ever nice paper!!) and then sponged Chocolate Chip Classic Ink here and there on the cards to match the distressed look of the patterned papers. Copic Markers were used to color in the images (that were stamped with Brilliance Graphite Black ink). 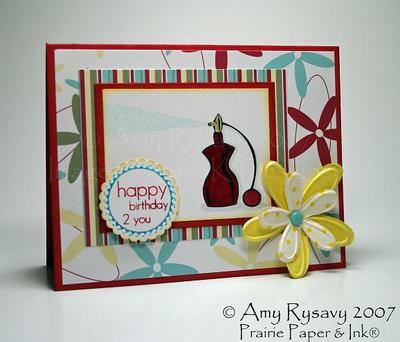 I added dabs of liquid applique to this image then poured on Dazzling Diamonds (Stampin' Up!) glitter before heating the applique to make it fluffy and glittery. The snowflake brads I got from my local scrapbook store a few weeks ago, and the round brads are Stampin' Up! The ribbon is brown satin from May Arts. I used a Spellbinders Scalloped Rectangle Die to cut out and emboss the main image, sponging the edges with Chocolate Chip ink. The ribbon is red satin from May Arts. CONGRATS GOES TO JEN OFIANA!! E-mail me with your mailing addy Jen and I will get that info sent on to Kristi ASAP!! It's a set of 28 sentiments and there are a lot of different ones in it compared to your normal "all occasion" sentiment set - I can't wait to get mine! Since it's Thanksgiving tomorrow for all my American readers (us Canadians celebrated Thanksgiving last month!) I think it'd be appropriate to have each person who leaves a comment say what you are thankful for don't you?? Please only one entry per person and on Sunday I will use random.org to pick a winner! Good luck and Happy Thanksgiving!! I made all of these cards a couple of weeks ago when I was at that weekend retreat and finally got the pics uploaded and edited and on here to share! 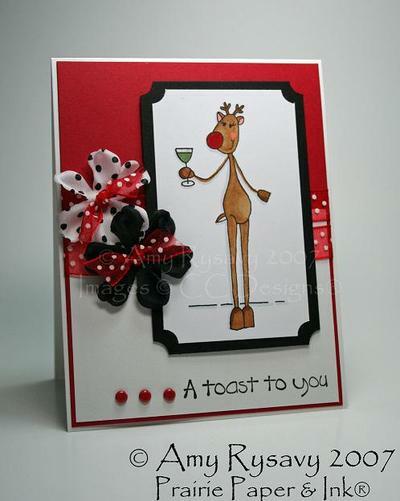 On all 4 cards I used stamps from the CC Designs Reindeer Games stamp set (isn't it CUTE?? And you get a TON of sentiments and images for the price too!). All the reindeer were colored in with Copic markers, and although you can't see it they all glitter here and there b/c I used my Copic Spica Glitter Pens on all their noses and antlers and other places (you can check out my Spica AtYou review here). 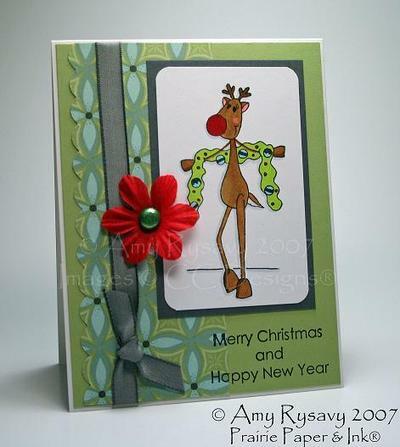 For this card I used red May Arts satin ribbon (I am so in love with this ribbon - it is SO pretty and ties so nicely!! ), and a red Silk Road Prima attached with a snowflake brad (those brads I got from my local scrapbook store a couple of weeks ago). The card stock is Stampin' Up! - the Soft Sky is the new textured CS - I LOVE that stuff - it's exactly the same as Bazzill textured CS but in SU colors. Same red satin May Arts ribbon on this card (I tied the bow separately and attached it with a glue dot). 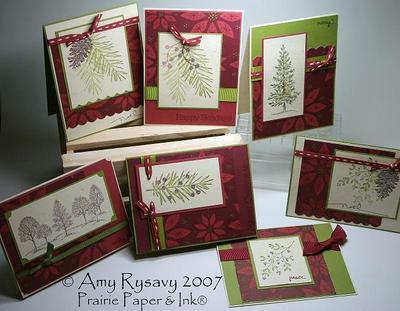 The patterned paper is from Stampin' Up!. 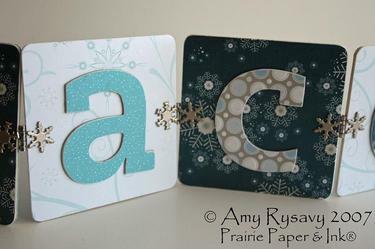 Again the patterned paper is from Stampin' Up!, and the ribbon is SU! 's Basic Gray taffeta. The red flower is a new Prima Esprit and I attached it with a glittery Making Memories brad. Flowers are black Prima Esprites, ribbon is May Arts. I threaded the ribbon through the flower centers then tied it to hold them in place - this works best with fabric flowers (which all the new Esprites are) as they won't tear like paper flowers will when you pull the ribbon tight. WOW.....want some Copic markers for FREE???? 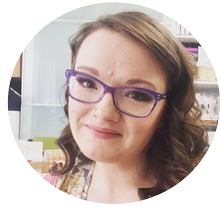 Then head over to GinaK's blog and post a comment on THIS POST <--------click!! She's going to pick one winner who will receive a 36-count set (their choice!) of Copic CIAO's - that's worth $150!!! How awesome is that?? ?